I’ve been searching for a good WordPress client a long time. Now I’ve finally found Wordmobi, a WordPress client for your S60 device. The freeware application works on all the latest S60 devices. 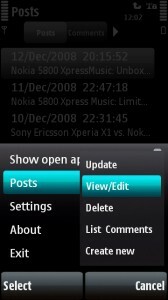 I tested the application on my 5800 Xpress Music and on the Nokia N85 and it worked fine on both devices. Using Wordmobi you can write and edit post, edit and write comments and posts and create new categories. It works with wordpress.com blogs as well as with self hosted blogs using wordpress.org. So you can manage your whole blog on the go. Here you can download Wordmobi. However, first you need to download and install Python for S60. How about multiple blog support and combining wordpress.com with YouTube? Wow, This is what I need. Very convinient and practical for blogging. Thank you! Thank you, very nice job !!! the combination with wordpress would be great. yes good stuff and great resource! On my nokia E71 i get ‘certificate error’ after downloading word mobi app and installing it. I got my phone recently, do i need to do a firmware upgrade? It´s another great python application for my good old N95. Like python applications very much. Thanks for sharing.